Authors are welcome to submit their contents presented in PowerMEMS 2017 to Special Issues in JMM/SMS. Note that the publication will be through the normal peer review process. Original manuscript in the proceedings will not be accepted due to its short length. Authors are strongly suggested to revise the manuscript by elaborating the introduction, adding more data/description for the results, adding more references, and so on. 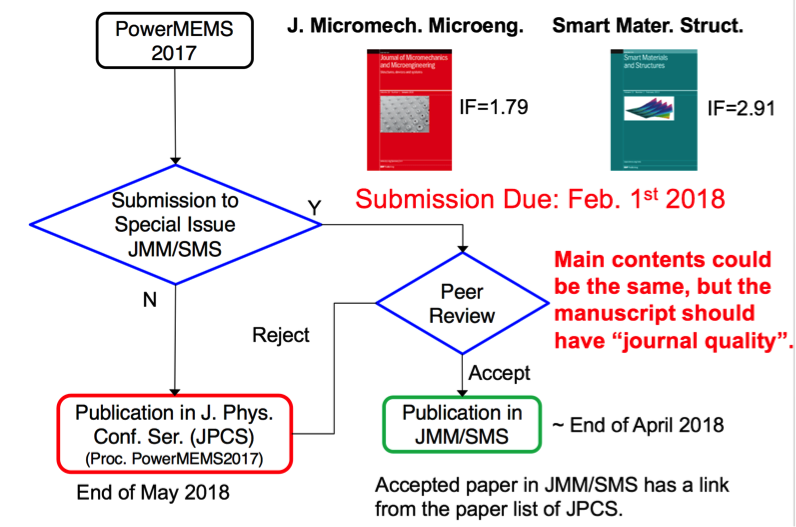 Note also that overlap with your proceeding manuscript in PowerMEMS is not the issue, because your manuscript will not be published in Journal of Physics Conference Series when accepted for SMS. See below for the guidelines of SMS and JMM. We are delighted to welcome submissions from this year’s PowerMEMS conference, held in Kanazawa, Japan from November 14-17th. Smart Materials and Structures is a multi-disciplinary journal dedicated to technical advances in (and applications of) smart materials systems and structures, including: intelligent systems, sensing and actuation, adaptive structures, and active control. We invite you to submit Research Papers, up to 9000 words in length, containing original work for peer review, as part of our special issue ‘Selected Papers from PowerMEMS 2017’. •Please choose 'Special Issue Article' when prompted to select your article type. •Choose ‘Selected Papers from PowerMEMS 2017’' from the list of options in the drop-down menu at the bottom of the online submission form. •Please complete all other sections on the submission form. Please note that Smart Materials & Structures does not publish proceedings papers. All Special Issue articles must comprise new, significant and unpublished work. We will only consider novel research, which presents an advance beyond previously published literature. Papers submitted for possible inclusion in this collection can contain work presented at PowerMEMS 2017, providing they also include new, unpublished results which further advance, or offer further insight into, a particular sub-field. As a guide, we strongly encourage submitting authors to ensure that their submissions to SMS include at least 50%, new, unpublished results (Note: Overlap with your proceeding manuscript in PowerMEMS is not the issue, because your manuscript will not be published in Journal of Physics Conference Series when accepted for SMS). Papers which do not meet this standard may be rejected without peer-review. Papers will be published immediately upon acceptance and collated into an online collection. Therefore, there will be no delay in the publication of accepted papers. Each paper will be published in the issue which is open and then collected in virtual collection. All Special Issue articles must comprise new, significant and unpublished work. No overview or perspectives-type articles will be considered for publication. Papers are refereed to the same high standards as regular research articles. (Note that all submissions are submitted to a plagiarism detection system.) Articles reporting work that was originally presented at the PowerMEMS conference may be submitted, provided that it does not also appear in the conference proceedings. On the Article Information page select 'Special Issue Article' as the article type. A drop-down menu will appear where you should choose: 'Selected papers from PowerMEMS 2017'. The accepted papers will be collected on a special issue landing page (like this one from the 2016 edition: http://iopscience.iop.org/journal/0960-1317/page/PowerMEMS-2016). Therefore, there will be no delay in the publication of accepted papers. Each paper will be published in the issue which is open and then collected in virtual collection. JMM has no page limits and no page charges.